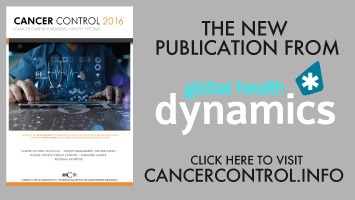 In recent years, there has been a worldwide increase in infections caused by multidrug-resistant organisms (MRDOs). The threat of antimicrobial resistance (AMR) is one of the major challenges associated with the management of surgical infections. Ohe increasing prevalence of AMR is responsible for a significant increase in morbidity and mortality rates associated with surgical infections, as well as a subsequent increase in overall healthcare costs (1, 2). Although AMR is a natural phenomena that occurs as bacteria evolve, there is a well-established relationship between antimicrobial prescribing practices and the emergence of antimicrobial- resistant pathogens (3). prescribing and dispensing the right antimicrobial(s) to treat the illness (3). By optimizing the use of antibiotics, clinicians improve patient outcomes and provide better initial antibiotic administration, minimizing the chances of AMR (3). In surgery, antibiotics are used as prophylaxis or as therapy. The use of antibiotic prophylaxis contributes considerably to the total amount of antibiotics used in hospitals and may be associated with increases in antibiotic resistance and healthcare costs. It has been shown that approximately 15% of all antibiotics in hospitals are prescribed for surgical prophylaxis (4). Perioperative antimicrobial surgical prophylaxis should be recommended for operative procedures that have a high rate of postoperative wound infection or when foreign material is implanted. However antibiotics alone are unable to prevent surgical site infections and strategies to prevent surgical site infections should always be respected. Antimicrobial therapy is a key component of daily work for surgeons. Surgeons prescribing antibiotics have two contradictory responsibilities. They should offer optimal therapy for patients under their care and on the other hand they should preserve the efficacy of antibiotics and minimize the rate of emergence of MDROs (3). In Table 1, suggestions for surgical antibiotic prophylaxis are illustrated (4). In Table 2, suggestions for antibiotic therapy in patients with surgical infections are illustrated (3). 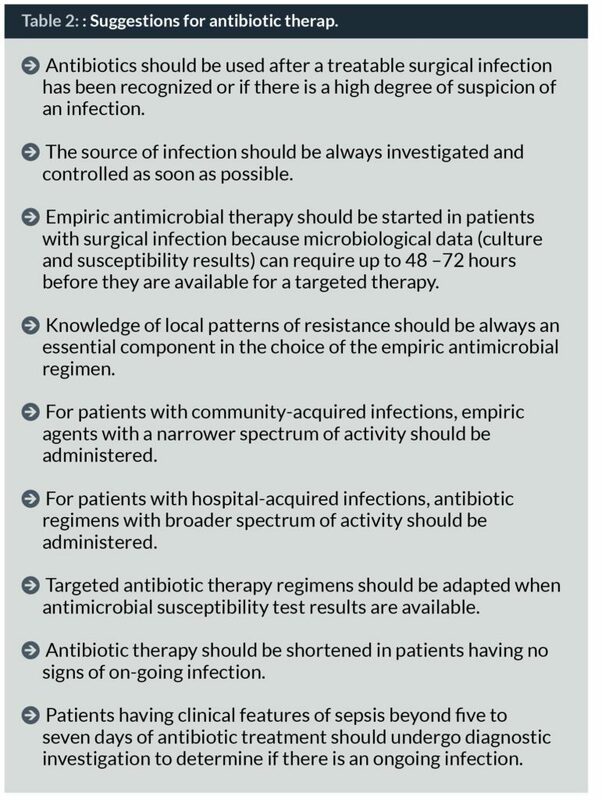 Given the complexity of AMR and associated issues with optimizing treatment of patients with surgical infections, a multidisciplinary approach is paramount, although it is not always possible in real-life clinical practice. The best means of improving antimicrobial prescriptions in general, and in emergency surgical units worldwide is through collaboration among the various specialties within a healthcare institution. Every hospital worldwide should work within its resources to create an effective multidisciplinary teams to combat AMR given its budget and personnel constraints. In 2016 an international multidisciplinary task force from 79 different countries created an alliance by sharing a document on the rational use of antimicrobials for patients with HAIs. The project has been termed AGORA (Antimicrobials: A Global Alliance for Optimizing their Rational Use in Intra-Abdominal Infections)(3). The position paper aimed to review the consequences of antimicrobial use, the evidence behind the global phenomenon of AMR, and to summarize the general principles of antimicrobial therapy in the modern management of patients with intra-abdominal infections. This collaboration involved an international multidisciplinary task force, promoted by the World Society of Emergency Surgery (WSES), and endorsed by the Surgical Infection Society (SIS), the American Association for the Surgery of Trauma (AAST), the Panamerican Trauma Society (PTS), the Indian Society for Trauma and Acute Care (ISTAC), the Korean Society of Acute Care Surgery (KSACS), the World Society of Abdominal Compartment Syndrome (WSACS), the South African Society of Clinical Microbiology (SASCM), the Hellenic Society for Chemotherapy, the Italian Society of Anti-Infective Therapy (SITA), The Italian Society of Anesthesiology, Analgesia, Resuscitation and Intensive Therapy (SIAARTI), the Italian Society of Surgery (SIC), the Italian Association of Hospital Surgeons (ACOI), the Italian Society of Emergency Surgery and Trauma (SICUT), the Italian Society of Intensive Care (SITI) and the World Alliance Against Antibiotic Resistance (WAAAR). Recently, a Global Alliance for Infections in Surgery was founded and more than 140 experts from more than 80 countries worldwide joined the International Advisory Board (6). The Global Alliance for Infections in Surgery aims to include all professionals involved in the battle against infections in surgery. The mission of the Global Alliance for Infections in Surgery is to educate healthcare providers in promoting the standards of care in managing infections in surgery worldwide. Since physicians are primarily responsible for the decision to use antibiotics, educating the attitudes and providing the knowledge that underlie their prescribing behaviour is crucial for improving antimicrobial prescription. The Alliance is convinced that in the fight against AMR a multidisciplinary approach should be mandatory. Epidemiologists and infection control specialists, infectious diseases specialists, microbiologists, hospital pharmacists and pharmacologists, surgeons and intensivists should be all involved; each professional contributing his or her expertise. Only by a cohesive approach may the battle be won against infections in surgery and for the judicious use of antibiotics. Encouraging multidisciplinary collaboration within the health system to ensure that the prophylactic and therapeutic uses of antimicrobial agents result in optimal patient outcomes should be crucial in the era of AMR. In this setting surgeons should always be aware that making judicious antibiotic prescriptions is an integral part of good behaviour. If surgeons around the world are able to participate in the global fight against antibiotic resistance and demonstrate awareness of the major problem of AMR, they will become pivotal in this fight. Surgeons are at the forefront of managing patients with infections who often need immediate and adequate antimicrobial therapy, and they are directly responsible for the outcome. It is crucial that surgeons have awareness of the problem of antibiotic resistance and understand that using antibiotics inappropriately may increase the likelihood of treatment failures and AMR. Dr Massimo Sartelli, MD, is consultant surgeon at the Department of General and Emergency Surgery, Macerata Hospital, Italy, Coordinator of Scientific Activities and member of the Hospital Infection Control Committee. He has performed more than 3,000 operations of general and emergency surgery and is the author/co-author of seven manuals of emergency and general surgery, and many publications in international scientific journals. In recent years, his studies have focused especially on surgical infections and sepsis and he coordinated the WSES Guidelines for Management of Intra-abdominal Infections, the WSES Guidelines for Management of Skin and Soft Tissue Infections and the WSES Guidelines for Management of Clostridium difficile Infection in Surgical Patients. 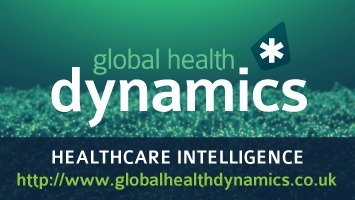 He designed and coordinated three multicentre prospective studies (CIAOW Study, CIAO Study and WISS Study) involving medical institutions worldwide defining epidemiological and management profiles of intra-abdominal infections worldwide. He is founder and acting director of the Global Alliance for Infections in Surgery (www.infectionsinsurgery.org). 1. Rao GG. Risk factors for the spread of antibiotic-resistant bacteria. Drugs. 1998;55:323-330. 2. Deege MP, Paterson DL. Reducing the development of antibiotic resistance in critical care units. Curr Pharm Biotechnol. 2011;12:2062-2069. 3. Sartelli M, Weber DG, Ruppé E, Bassetti M, Wright BJ, Ansaloni L, Catena F, Coccolini F, Abu-Zidan FM, Coimbra R, Moore EE, Moore FA, Maier RV, De Waele JJ, Kirkpatrick AW, Griffiths EA, Eckmann C, Brink AJ, Mazuski JE, May AK, Sawyer RG, Mertz D, Montravers P, Kumar A, Roberts JA, Vincent JL, Watkins RR, Lowman W,Spellberg B, Abbott IJ, Adesunkanmi AK, Al-Dahir S, Al-Hasan MN, Agresta F,Althani AA, Ansari S, Ansumana R, Augustin G, Bala M, Balogh ZJ, Baraket O, Bhangu A, Beltrán MA, Bernhard M, Biffl WL, Boermeester MA, Brecher SM, Cherry-Bukowiec JR, Buyne OR, Cainzos MA, Cairns KA, Camacho-Ortiz A, Chandy SJ, Che Jusoh A, Chichom-Mefire A, Colijn C, Corcione F, Cui Y, Curcio D, Delibegovic S, Demetrashvili Z, De Simone B, Dhingra S, Diaz JJ, Di Carlo I, Dillip A, Di Saverio S, Doyle MP, Dorj G, Dogjani A, Dupont H, Eachempati SR, Enani MA, Egiev VN, Elmangory MM, Ferrada P, Fitchett JR, Fraga GP, Guessennd N, Giamarellou H, Ghnnam W, Gkiokas G, Goldberg SR, Gomes CA, Gomi H, Guzmán-Blanco M, Haque M, Hansen S, Hecker A, Heizmann WR, Herzog T, Hodonou AM, Hong SK, Kafka-Ritsch R, Kaplan LJ, Kapoor G, Karamarkovic A, Kees MG, Kenig J, Kiguba R, Kim PK, Kluger Y, Khokha V, Koike K, Kok KY, Kong V, Knox MC, Inaba K, Isik A, Iskandar K, Ivatury RR, Labbate M, Labricciosa FM, Laterre PF, Latifi R, Lee JG, Lee YR, Leone M, Leppaniemi A, Li Y, Liang SY, Loho T, Maegele M, Malama S, Marei HE, Martin-Loeches I, Marwah S, Massele A, McFarlane M, Melo RB, Negoi I, Nicolau DP, Nord CE, Ofori-Asenso R, Omari AH, Ordonez CA, Ouadii M, Pereira Júnior GA, Piazza D, Pupelis G, Rawson TM, Rems M, Rizoli S, Rocha C, Sakakhushev B, Sanchez-Garcia M, Sato N, Segovia Lohse HA, Sganga G, Siribumrungwong B, Shelat VG, Soreide K, Soto R, Talving P, Tilsed JV, Timsit JF, Trueba G, Trung NT, Ulrych J, van Goor H, Vereczkei A, Vohra RS, Wani I, Uhl W, Xiao Y, Yuan KC, Zachariah SK, Zahar JR, Zakrison TL, Corcione A, Melotti RM, Viscoli C, Viale P. Antimicrobials: a global alliance for optimizing their rational use in intra-abdominal infections (AGORA). World J Emerg Surg. 2016 Jul 15;11:33. 4. Sartelli M, Duane TM, Catena F, Tessier JM, Coccolini F, Kao LS, De Simone B, Labricciosa FM, May AK, Ansaloni L, Mazuski JE. 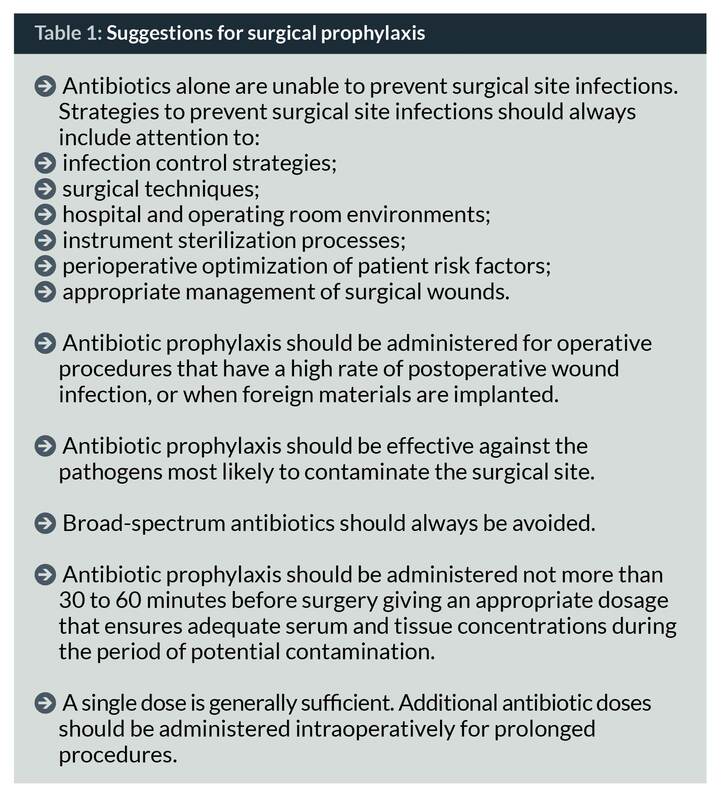 Antimicrobial Stewardship: A Call to Action for Surgeons. Surg Infect (Larchmt). 2016 Dec;17(6):625-631.